Are You Committing One of the 7 Deadly Mistakes Of Transit Software Implementation? You don’t let your fleet fall behind, so why would you let your IT department get stuck in the slow lane? Implementing transit software is a challenge not unlike rush hour. Understanding the route you need to take is paramount for success. 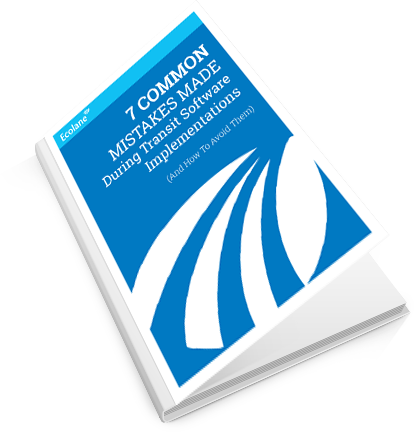 “The Seven Common Mistakes Made During Transit Software Implementation” eBook will ease your transition from your legacy transit software and keep your agency in the left lane. Fill out the form above to download the eBook and learn how to successfully implement transit software, to keep your agency and the public moving quickly. “The Ecolane project management and training was great. Daniel was very organized and shipped the training manuals prior to his arrival on-site. Ecolane managed everything throughout the project. We knew what was expected every step of the way. I have been through several technology implementations and this was the smoothest and most organized. We are doing things with Ecolane that mid- and large-sized transit systems can't do."